10. What are your future plans? (Give me a minute, I will mail you a PPT presentation I made on this subject). 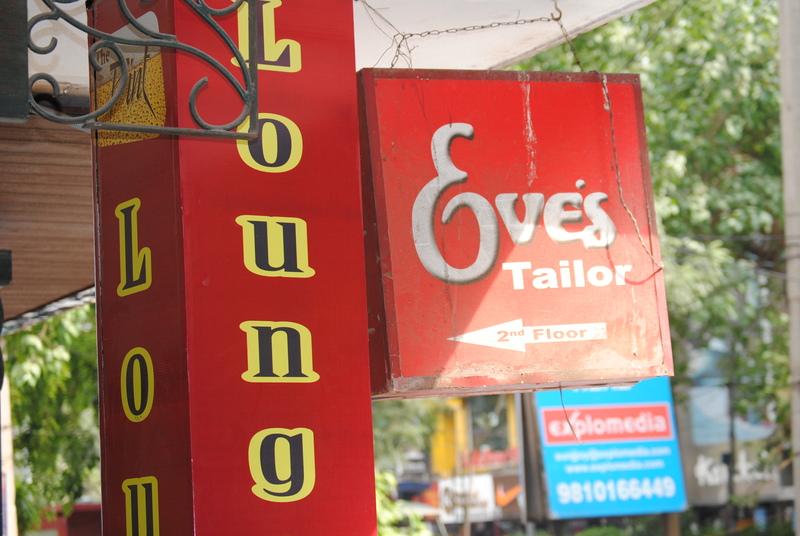 Eves – THE place for saree blouse. Trust me, it is much easier to find the perfect guy… when you compare it with the probability of finding a perfect saree blouse. It is hands down the trickiest garment of this Indian attire. Getting the fitting and styling correct is a work of art, and women would die for the master ji (as tailors in India are fondly called) who can achieve this. Now this piece of clothing which covers the upper body of a woman and shows off the waist to the best effect, is nothing short of a piece of art. As far as I remember, my mom and aunts and grandmas have always worn sarees as opposed to other comfortable options like salwar-kurta or jeans. 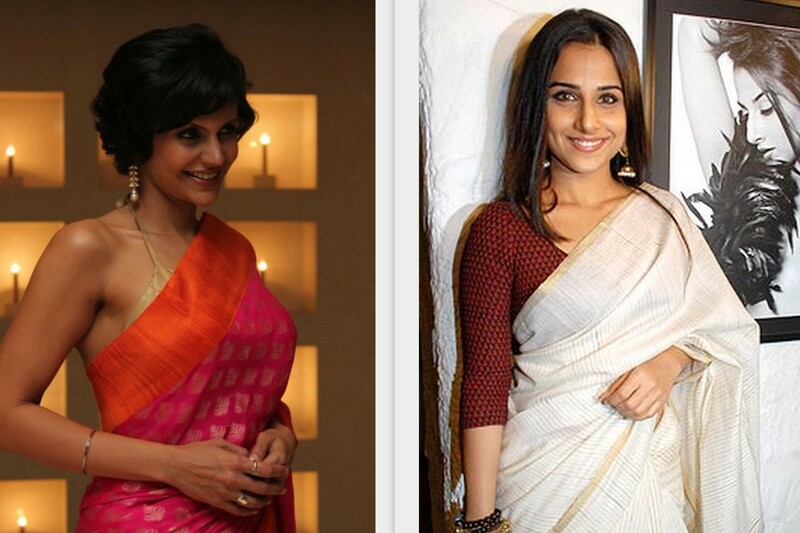 Two bollywood celebrities, Mandira Bedi and Vidya Balan are two ladies whom I adore for the way they wear saree and have given it a non-mom look. They make it glamourous too, I feel a large part of it is because of the blouses they wear. Finally, some colleagues told me about ‘Eves’ in Greater Kailash M Block market and told me they make the best ones in Delhi. A couple of weeks later I read an article about it in the newspaper I worked in, and so decided to check this place out. I think no other shop in that market has a board this tiny. I walked past it twice, but helpful shoppers directed me to the right place finally. I had just one blouse piece (an 80-centimetre or one metre piece of cloth either detached from the saree, or bought separately) with me, and had to wait for my turn as the ‘attending master ji’ that day — Vineet— took measurements and discussed styles designs with his client. There were just two ladies before me, so I was confident my turn would come soon. Can you believe it… I got master ji’s darshan after almost an hour! The first woman had seven blouse pieces, and she gave wanted a different design for all of them. Vineet master ji gave suggestions according to the saree it was to be worn with and the type of fabric of that piece. A few strokes of his pencil, and new design would be ready on a small piece of paper, which he would staple to the piece if approved by the client. So after the seven-wonder got over, the lady ahead of me gave just five pieces. But she took ages in negotiating the date of delivery. Apparently she was leaving for US in 10 days and wanted it by then. Master ji said he would try, but it would be very difficult. By that time, it was my turn. He gave me three design options, all drawn in front of me, and asked which one I like. I chose one, he promptly took the measurements and apologised that he won’t be able to deliver it before 3 weeks. I was in no rush, so I agreed. And the product which I got after three weeks, was worth the Rs 600 I paid for it. It does seem very expensive, as the starting price itself is 600 for the simplest of blouses. It goes up as the complication in design increases, or if you had embellishments like zardosi work, swarovski crystals, pearls or beads etc. Vineet’s team of Pawan master ji and Irshaad master ji make padded ones as well as non-padded ones, and their finishing is very professional. Styles like halter, sleeveless, chammak chhallo style (Kareena’s red blouse in Ra. One), or corset style, they can make it all. Fitting is awesome. I got all blouses for my wedding made by them, and I was extremely happy with their work. Of course, you need to keep in mind that they take 15 days to one month during the peak season (October to March), so plan your trip to Eves accordingly. I think the best part is that they courier it if your stay in Delhi is a short one. I just placed an order for five corsets worth Rs 12,000 and they are going to courier it to my cousin who lives in Mumbai. Cool na! I was chatting with my fiance the other day and we were in the middle of our usual mudslinging sessions (“You jhuggi patrakaars” and “you dumb faujis“), when I realised one thing. I constantly sought refuge in the “A pen is mightier than the sword” line, but I couldn’t remember the last time I saw a pen in my house. I don’t have one in my bag either. If I were to ask any of my colleagues in office for a pen, 13 out of 14 will say “sorry, I don’t have one”. Power of pen indeed! See don’t think of us as lousy journalists just because we don’t carry pens. It all happened about two decades ago, when computer barged in on our lives and made itself comfortable in our living room. Now in 2012 it so happens that we can type faster than we can write. In fact I think the last time I actually wrote a full page (using a pen) was in my BSc. final year exam. My J-school insisted that all assignments and tests should be typed and given as printouts. So now, we all go to tournaments (I am talking specifically about sports journalists) and make notes on our laptop. If we are interviewing a sportsman, we switch on our dictaphone or mobile phone’s recording application. Very rarely do we take out a notepad and a pen. One of my colleague lost three Parker pens a month after joining a leading newspaper office in New Delhi, and since then has vowed he won’t carry one. I don’t think I have bought one for the last 3-4 years. I rely heavily on pens (and notepads) which we get in Press Conferences. Once the organisers of the Press Conference did not give us pens with the press release folder. Needless to say, I (or anyone else present there) did not take down any notes. Oh and it’s actually a good thing that we don’t take down notes, because whatever we write has a shelf life of just 30 minutes. If we don’t start typing your story within those 30 minutes, chances are we won’t understand what we have written. Those pages transform into doctors’ scribble… no wait, at least a pharmacist understands those words. So, whoever said ‘pen is mightier than a sword’, I think he should edit it to “A keyboard is mightier than an AK-47”. I just started watching F.R.I.E.N.D.S for the sixth time. And thanks to my worse than pathetic memory, I am enjoying every moment of it! I don’t know why but the jokes are still funny to me, even though the series is almost two decades old. I didn’t have cable at my place, so I apart from catching the occasional episode at Ketki’s place, I didn’t really follow it with any dedication. It was when a friend of mine gave me a couple of episodes in his pen drive. I saw those 6-7 episodes many times and then pestered him to give me the complete set. I was to leave for Bangalore in 15 days and finishing all those episodes before that looked as difficult as my BSc Math paper. Each episode is 24 minutes long. There are 24 episodes in each season. There are 10 seasons. So 10x24x24/60 = number of hours I would need to finish this mountain! Its 96 hours by the way, according to the calculator. Now I am awake for maximum of 12 hours in a day (I think I belong to the cat family, they sleep a lot you know!). Out of which I could easily devote 8 hours to watching Friends, since I didn’t have any college to attend. Again, according to the helpful calculator in my laptop, I would need 12 days to finish it off. I had 15 in hand! Tough job my friend, which I completed and am still waiting for the President of India’s Letter of Appreciation. I spent the next three days packing (refer to the previous post to know how much I hate it) and burning all the Friends episodes onto CDs (I didn’t own a laptop then and had complete faith in my parents that they would delete it the moment I leave the house). Till today, this sitcom has helped me through rough days and bad moods. Laughter sure is the best medicine, especially when Chandler Bing is administering it to you. All these years, I have seen so many sitcoms and was thinking maybe I won’t find this one that interesting once I decide to watch it again (since it now belongs to another generation). I am being proved wrong right this moment… I just finished watching ‘Monica and Chandler get married’. But now I have some doubts which I think earlier I was too naive to figure out. How on earth do all of them hang out in Central Perk in the middle of the day? Don’t they have, as Rachel puts it, “that work thing”? And also, don’t they EVER lock their front doors? They just barge into each others apartments, which is fine by me. But living in a place like Delhi has taught me that if your front door is not locked, you move up the list of being potentially robbed or raped. No such issues in New York City? Probably once I finish the 10th season, I would have some more such questions. And I demand the answers to them. Arnab Goswami, “how you doin’“! Put that on, and even if you are not one, you would definitely look like a true blue Marathi mulgi! 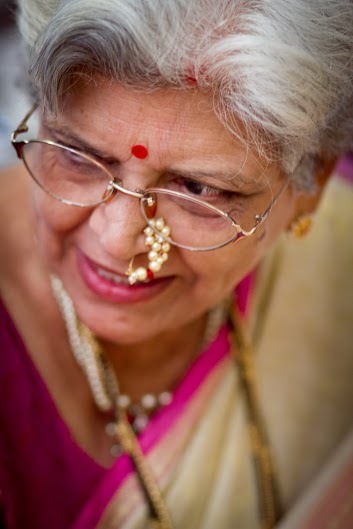 A typical Maharashtrian nosepin (or nath in marathi) is one piece of jewelery that is typical of this state and is worn by women during auspicious occasions like weddings or pooja. It is made of pearls and small colored stones. 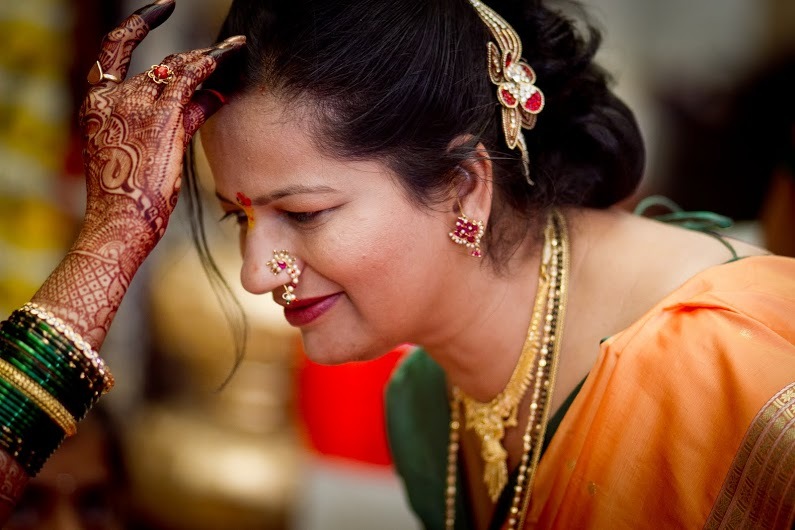 It’s peculiar shape, as shown in the pictures with this post, makes it the most unique nose ornament in India, which are generally round shaped or resemble a ring. Remember Priyanka Chopra in the “Raat ke dhai baje” song from Kamine, or Kajol at her own wedding…Yes they were both wearing one. Even Rani Mukherjee was recently spotted in a function in Pune wearing a nath and a Paithani saree. The best thing about it is that you don’t need to pierce your nose, its a clip-on and thats why scores high on convenience scale. And it is very cheap. My friend’s mom got one for me for just Rs 100. Remember some seven-eight years ago we were all either saving up to buy it or doing everything our parents said to get one out of them? When the guy who carried one around in college was a stud (no matter how he fell flat on face when he opened his mouth)? The time when we knew the 10-digit numbers of all our friends by-heart? And now in 2012, I sometimes wonder how people used to survive without a mobile phone? Orkut craze had caught up with us in 2006 and I used to have a good laugh at reading people’s “five things I can’t live without” section of their profile. It would always be something as cheesy as “your smile” or something as straightforward as “oxygen”. It annoys me that now I don’t have a calendar in my house or that I don’t wear a watch anymore. Why should I when my mobile has it all. It seems life has now become a never-ending journey to find a plug point — to charge your phone. The other day I was going through my engagement pictures. I realized I have more pictures with my cellphone than I had with my fiancé. 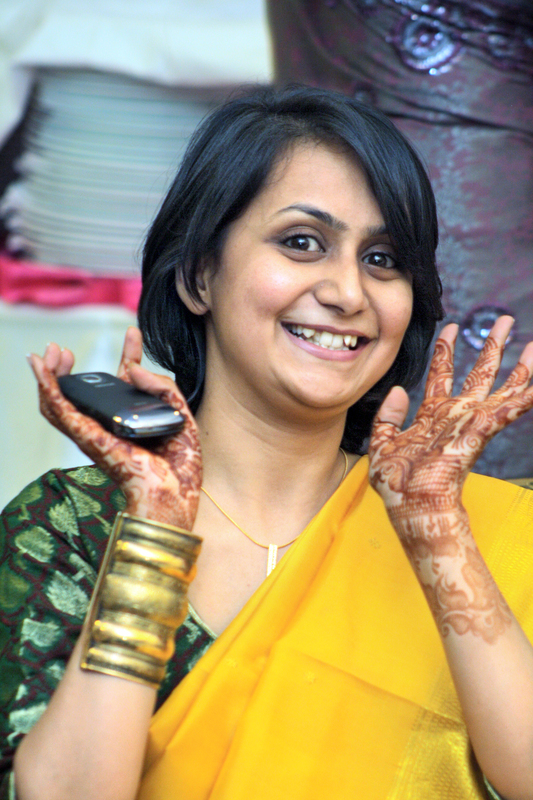 Since sarees don’t have pockets, my phone was visible in my hand, while my fiancé’s was safely tucked away in his suit pocket. I miss the time when we didn’t know who was calling… the mystery, the excitement, the thrill of answering a call on landline. Back then, screening a call would be a simple matter of pretending to be your own sister when it was someone you didn’t want to talk to. Yes I know I am evil. 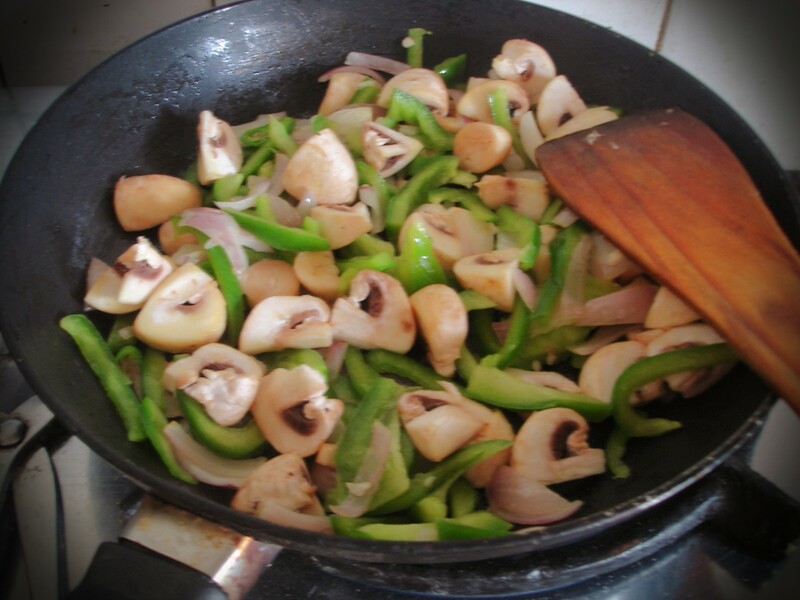 Add on (optional): Peas, mushrooms, ginger-garlic paste, spring onions and tomatoes. Cut them in thin slices. Since my carrot was ultra-thin, I decided to go for circular pieces instead of thin stick-like pieces. 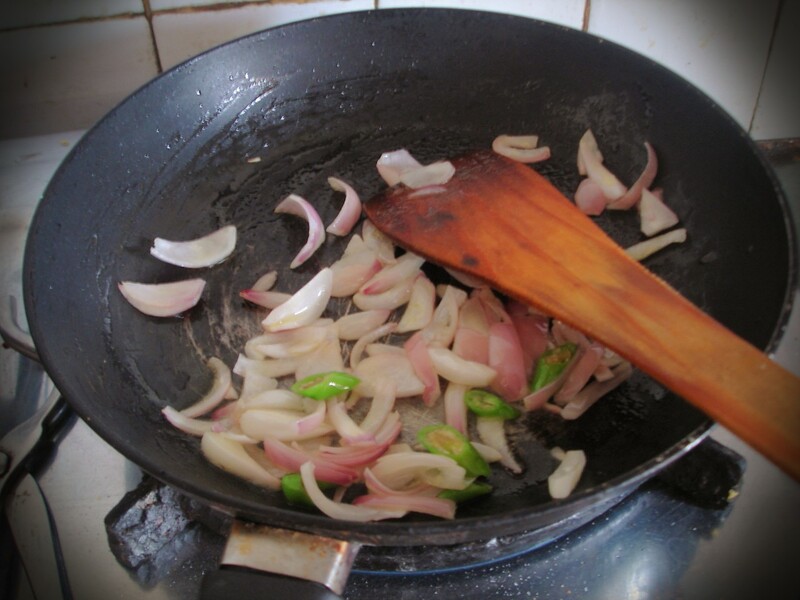 First stir fry the chopped onions and green chillies in one table spoon oil. 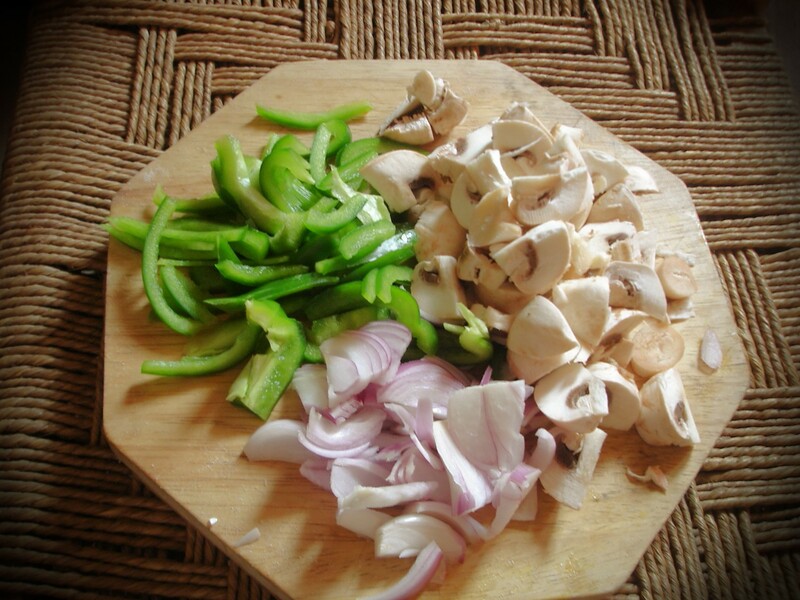 Add the rest of the vegetables and stir fry for 2 minutes. 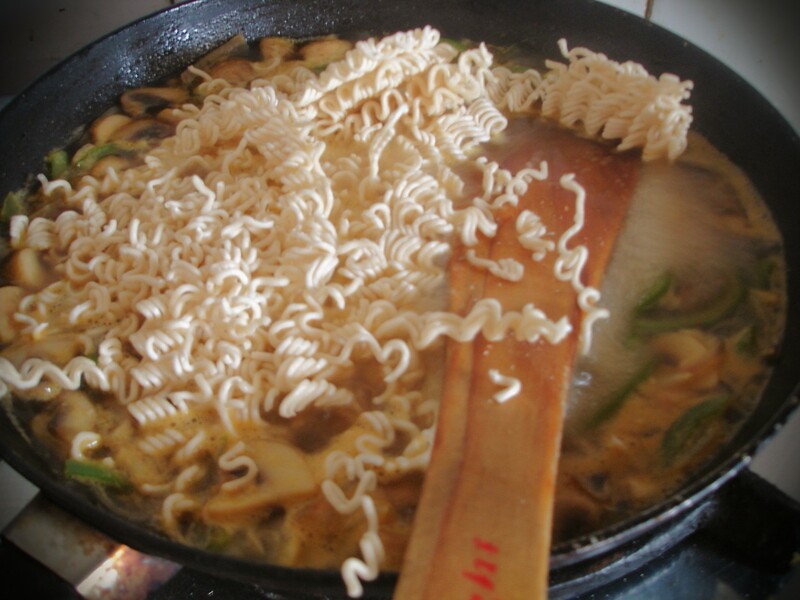 The aim here is not to cook (or overcook) the vegetables, otherwise they will become soggy after boiling. 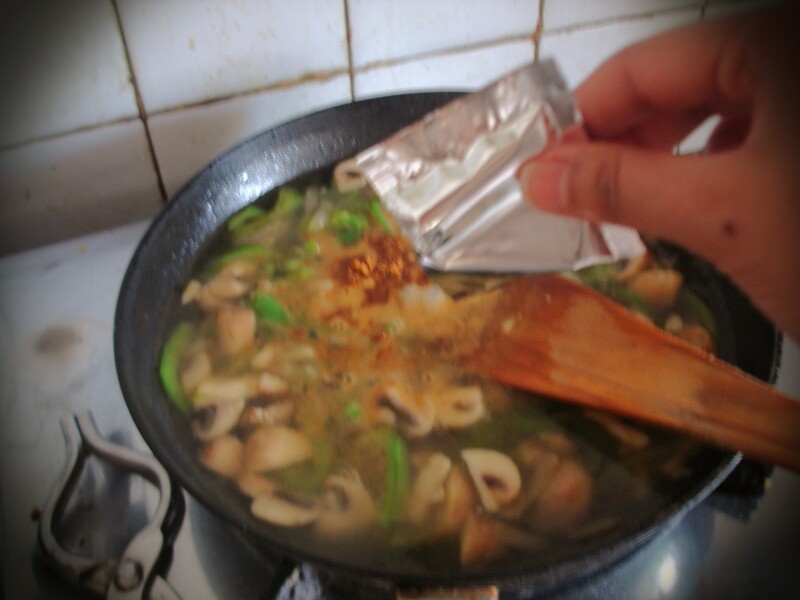 Add water as specified on the packet and add a pinch of salt. You would need to add salt because the tastemaker’s taste will get diluted becayse of all the vegetables. 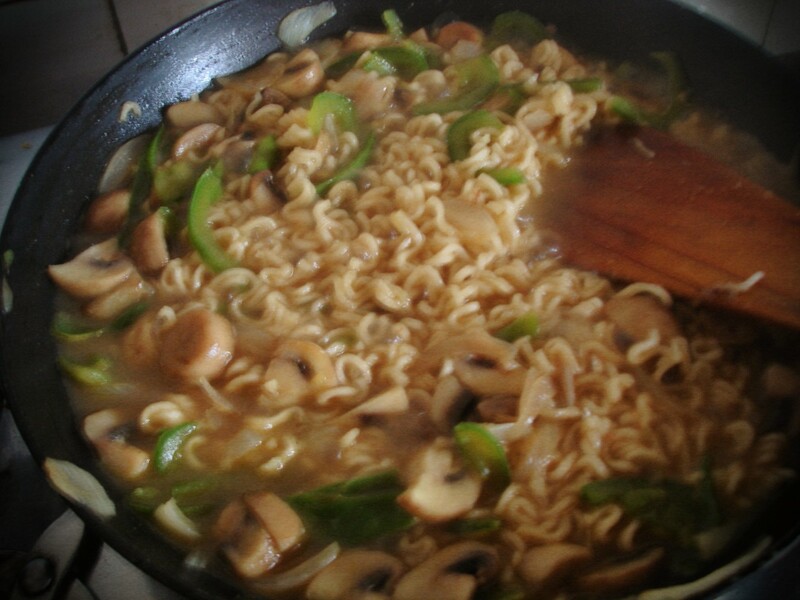 Let it boil for a minute before you add maggi noodles to it. Let it cook for two-three minutes, till all water is used up. Add a bit of Amul butter on the top and see the magic.! 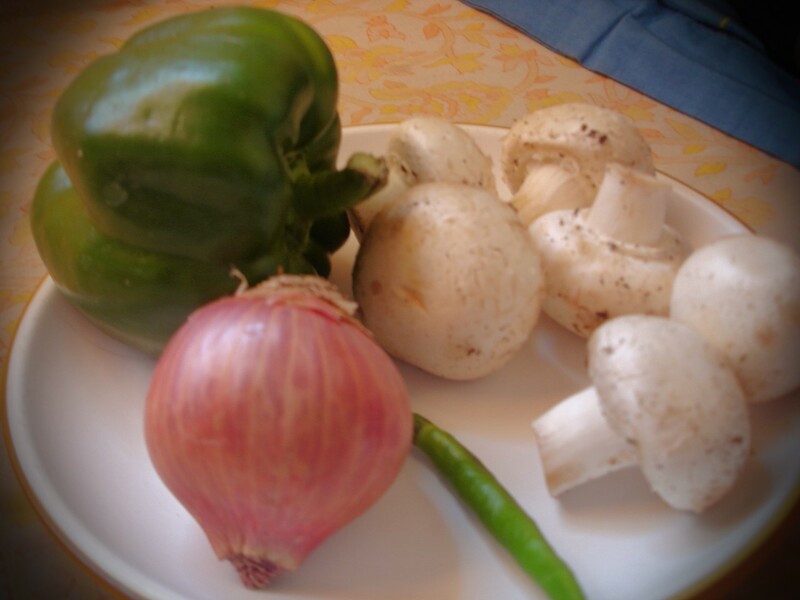 I have been a vegetarian for… 16 years of my life! I know I had non-veg when I was a kid but stopped when I was eight and saw Maneka Gandhi on the TV telling people how cute animals are butchered for it. I loved animals and birds and seeing them go through all that pain was hard for me. 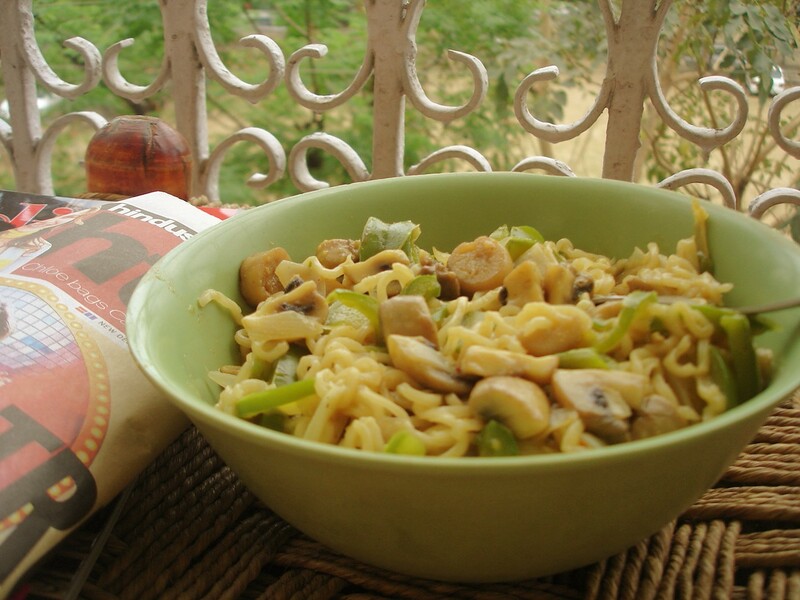 It helped that my mom (or dad) never cooked non-veg dishes at home. I think majority of my relatives are vegetarian but my parents and elder sister never had any issues. So many of my friends used to think my insistence on eating veg is due to “dharmic” reasons. Well it was not. I survived school and graduation without eating even eggs. When I moved out of Indore and stayed in a hostel in Bangalore, the spicy masaledar look of chicken in our mess did test me a lot. I gave in and had a piece in the second month of my stay there. Our mess cook was not a very good one, so it didn’t taste as good as it looked. But I had started eating omlette and anda-curry there after one of my friends convinced… no no… brainwashed me that no chicks are every gonna come out of these eggs. Fast forward to the year 2010. 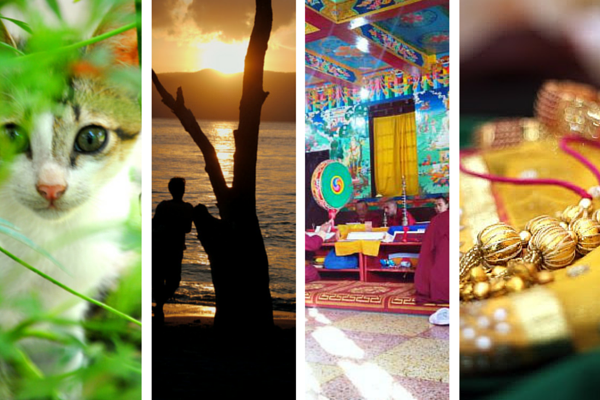 I was in Pune and we were just a week away from a 5-day Goa vacation! I should mention Goa is jinxed for me, I have made plans and un-made them so many times, that I now think it’s just easier to plan for Japan or Sri Lanka. So at that time, I thought I am gonna do whatever people in Goa do.. booze, fish, fling and all that! That trip got cancelled at the last minute, and I decided to go to Indore instead (I had already asked my boss for leave, and it’s against my principles to let go of such opportunities). My friends and I decided to do all those things in Indore which we had on agenda for Goa. So we went out, drank, danced… and I had fish! Now see, its hard to stop when Pune boasts of some of the best seafood restaurants and believe me, Konkani fish recipes are still my hot favourite. I felt very very stupid! And he was right! This was when I was living in Delhi, and my department was filled with beef-eaters! They had sucked me into their gang with chicken momos (the veg ones were terrible) and I thought there’s no logic in refusing chicken curry when I had already had thousands of chicken momos. The vegetarian died a barbaric death. But I still intend to keep off beef. After all gai hamari mata hai. Mata ko kaise khaoon? PS: A colleague of mine, the only remaining vegetarian, has started eating eggs. I can see where this is going!